p8 is a DNA-binding protein induced in many tissues in response to LPS treatment. Hence, p8 could be a mediator of LPS-associated effects or, on the contrary, p8 expression may be part of the protective mechanism of the tissues in response to LPS. Finally, p8 expression in response to LPS could also be a simple epiphenomenon. To investigate the role of p8 in vivo, we generated p8-deficient mice by gene targeting. Because p8 is a stress protein, we analyzed the response of p8-/- mice to a systemic stress induced by LPS injection. Liver was chosen as model organ to monitor alterations in gene expression. LPS resulted in higher serum TNF-α concentration and higher mortality rate in p8-deficient mice than in wild-type. Also, liver and pancreas, but not lung, from p8-/- mice showed increased amounts of MPO and HPO. To gain insight into the molecular bases of such susceptibility, we used high density DNA microarrays consisting of ~6000 genes and ESTs to compare gene regulation in response to LPS in p8+/+ and p8-/- livers. In wild-type, 105 genes and 73 ESTs were up-regulated and 232 genes and 138 ESTs down-regulated. By contrast, 212 genes and 125 ESTs were found up-regulated and 90 genes and 85 ESTs down regulated in p8-/- mice. Among them, only 93 (51 induced and 42 repressed) corresponded to the wild-type pattern, demonstrating that p8 deficiency hinders the normal response to LPS, which may account for the increased sensitivity of p8-/-mice to the endotoxin. The large number of genes showing abnormal regulation after LPS suggests that p8 is an important regulatory factor involved in many cellular defence pathways. Using a systematic approach, we identified a new gene, called p8, whose expression is strongly induced during the acute phase of pancreatitis . The deduced protein sequence revealed that p8 was an 80 aminoacid polypeptide whose primary structure could not be aligned with any of the protein sequences present in public databases. By contrast, p8 contains a canonical bipartite signal for nuclear targeting suggesting that p8 should be located in the nucleus. Supporting this hypothesis we detected p8 within the nucleus of Cos-7 cells transfected with a p8 expression plasmid, although it was also partly located to the cytoplasm . Furthermore, analysis of p8 primary structure suggested that it should be a DNA-binding protein . More recently, we performed biochemical and biophysical studies showing that human recombinant p8 was in many structural aspects very similar to the "high mobility group" (HMG) proteins, although sharing with them little aminoacid sequence homology . In addition, p8 binding to DNA, rather weak with the native protein, was strongly enhanced after phosphorylation by PKA of serine/threonine residues . HMG protein binding to DNA is also regulated by post-translational modifications . Thus, in spite of a lack of significant sequence homology, p8 can be considered as a HMG-like protein. It is interesting to note that HMG1, a member of the HMG family of proteins, is a potent pro-inflammatory mediator released passively by necrotic cells but not by apoptotic cells [reviewed in ]. Further experiments have shown that p8 activation is not restricted to pancreatic cells. In vivo, p8 mRNA is activated in several tissues in response to systemic lipopolysaccharide (LPS) treatment  and in vitro studies showed that a variety of cell lines exhibited transient p8 mRNA expression in response to stress [1, 2]. p8 is therefore an ubiquitous protein induced by cellular stress which may be part of a general defence program against cellular injury or cellular stress. Concomitant studies by another laboratory  revealed that expression of the candidate of metastasis 1 (Com 1) protein, which is identical to human p8 , mediates the growth of tumour cells after metastatic establishment in a secondary organ, suggesting that activated expression of p8 in metastatic cells is required for tumour progression and this hypothesis was recently confirmed . Also, overexpression of p8 in certain cell lines promotes growth [1, 2] but it can also inhibit growth when recruited by inhibitory signals . Taken together, these results suggest that p8 expression may regulate many cellular functions, in response to cellular injury or during tumour development, and that p8 may play different roles depending on the cell type and/or growth conditions. In response to stress, cells activate various intracytoplasmic pathways, depending on cell type and nature of the stress agent, that ultimately send to the nucleus signals that modulate gene expression. The new pattern of gene expression will help the cells resist the injury and, in case of systemic stress, the efficacy of the defence programs will condition the survival of the organism. Since p8 is activated in several tissues in response to LPS treatment , this molecule is a putative mediator of a protective response. To investigate this hypothesis, we have created by targeted disruption mice lacking the p8 gene. p8-/- mice showed normal development, they were fertile and their life-span was similar to that of wild type. However, DNA microarray analysis of gene expression in their liver showed important modifications, suggesting that their stress-response capacity could also be altered. Indeed, their mortality rate after LPS challenge was significantly increased compared to wild-type. LPS induced drastic changes in their pattern of gene expression in liver. Interestingly, that pattern was very different from the pattern induced by LPS in wild-type liver, which corresponds to the normal stress response. It was concluded that p8 is required for adequate response to LPS-induced injury. To investigate the function of p8, a null allele was generated in 129/Sv embryonic stem (ES) cells by replacing exon 2 of the p8 gene, which encodes 60% of the coding sequence, with a neomycin-resistance cassette. Germline transmission was obtained after injection of these ES cells into C57BL/6 blastocysts. Then, we intercrossed mice heterozygous (p8+/-) for the targeted disruption to produce homozygous offspring (p8-/-). These crosses provided litters of normal size, with living, apparently normal p8-/- offspring occurring with a frequency consistent with Mendelian inheritance. p8 deficiency was verified by RT-PCR and/or Southern blot analysis and by immunostaining of the pancreas with acute pancreatitis with a p8 polyclonal antibody (data not shown). Given these results and the extensive nature of the deletion, we concluded that the p8 mutation was null. Details about production of p8-/- mice should be obtained from authors upon request. p8 was initially defined as a gene activated in several tissues in response to LPS treatment . Hence, p8 could be a mediator of LPS-associated effects or, on the contrary, p8 expression may be part of the protective mechanism of the tissues in response to LPS. p8 expression in response to LPS could also be a simple epiphenomenon. In this study, we analyzed whether p8 knockout mice would display altered reactivity to LPS. Groups of 20 mice each were injected with 70 mg/kg and lethality was monitored. 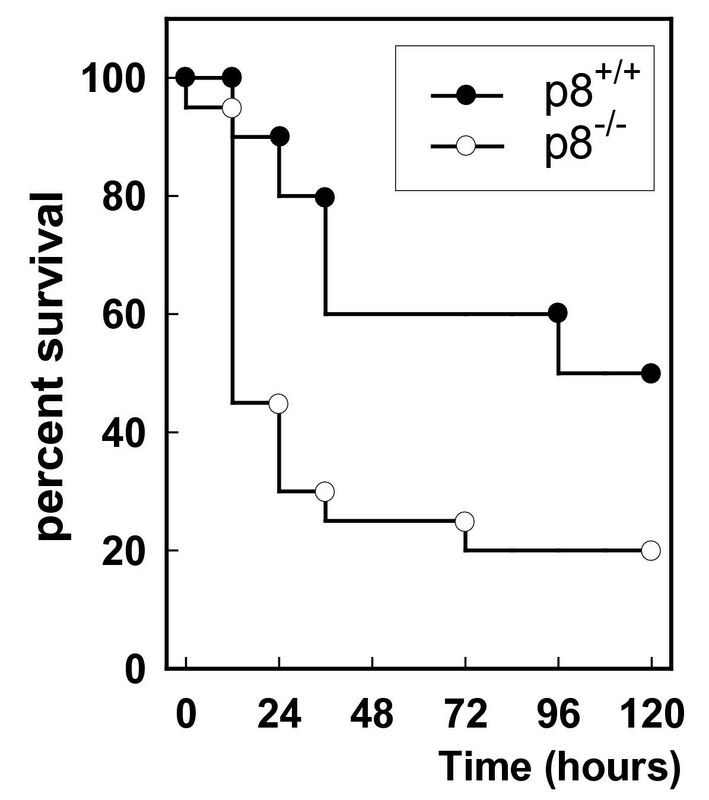 As shown in Figure 1, 70% of p8-/- mice died 36 hours after LPS treatment, compared to only 20% of p8+/+ mice. After 5 days 50% of p8+/+ and 20% of p8-/- survived. Thus, wild-type mice tolerated LPS treatment better than p8-/- mice. We monitored in parallel the serum levels of three cytokines. If levels of interferon γ (IFNγ) and the anti-inflammatory cytokine IL-10 were not different in p8-/- and p8+/+ mice (data not shown), the level of TNF-α was significantly higher in p8-/- mice (Figure 2), supporting the hypothesis that p8 expression provides some protection against LPS aggression. Finally, whether liver or pancreas could be differently affected by LPS challenge depending on the p8 status was evaluated by monitoring serum levels of GOT and amylase. No difference was observed (data not shown). Although these markers are not very sensitive, these results suggest that, in these two organs, lack of p8 expression does not increase markedly LPS-induced cell damage. Lipopolysaccharide (LPS)-induced mortality in 129/Sv wild-type and 129/Sv-backcrossed p8-deficient knockout mice. Groups (n = 20) of female mice were injected intraperitoneally with 70 mg/kg LPS (Salmonella thyphosa), and survival was monitored every 12 hours for 5 days. Wild-type and p8-deficient mice were injected intraperitoneally with 70 mg/kg LPS (Salmonella thyphosa), and serum samples were harvested after diferent times. TNF-α levels were determined by ELISA. Errors bars represent the standard deviation (n = 6). LPS is known to induce a systemic inflammatory syndrome characterized by strong leucocytic infiltration and free radical production which may be lethal . To investigate the role of p8 expression during LPS treatment we monitored MPO activity, as an indicator of tissue infiltration, and HPO concentration as an indicator of free radical production, known to correlate with the intensity of lesions. In control mice, liver, lung and pancreas showed increased MPO activity and HPO concentration after LPS injection, as expected (Figures 3, 4 and 5). In p8-/- mouse lungs, the kinetics of changes in MPO activity and HPO were the same as in wild-type mice (Figure 3). They were however very different in pancreas and liver, showing that p8 influence could vary among tissues. In liver from control mice, MPO activity increased sharply to a maximum already reached 6 hours after LPS injection, then dropped by 65% in the next 6 hours and decreased more progressively thereafter (Figure 4), indicating that liver recruited leucocytes for transient infiltration. In liver from p8-deficient mice, MPO activity increases progressively with a maximum at 18 hours suggesting that the mechanism of leucocyte recruitment was either altered or different from wild-type. Contrary to MPO activity, HPO production was similar in p8+/+ and p8-/- mouse livers. This is not surprising since HPO is produced by Kupffer cells  which are specialized macrophages residing in the liver. In pancreas from control mice, changes in MPO and HPO followed the same pattern, i.e. transient increase with maximum 12 hours after LPS injection followed by decrease towards control values. 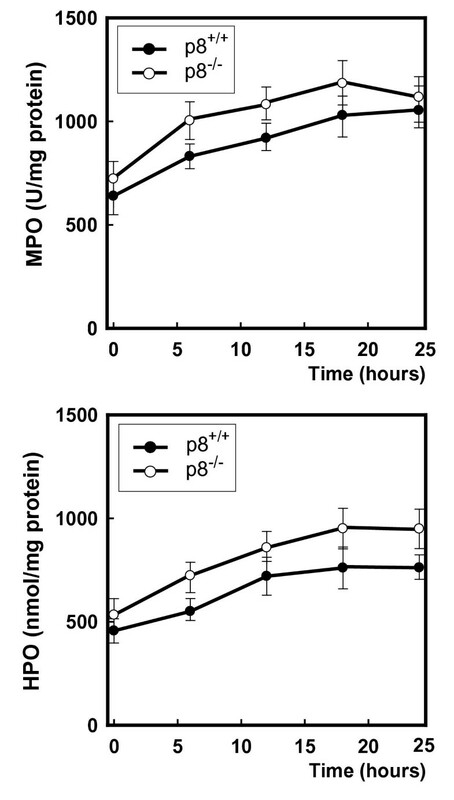 In p8-deficient mice, both MPO activity and HPO concentration remained elevated after 12 hours (Figure 5) underscoring the role of p8 in the regulation of infiltration and free radical production. Taken together, these results suggest that p8 contributes to the tissue response to LPS, such response being different in pancreas, liver and lung. 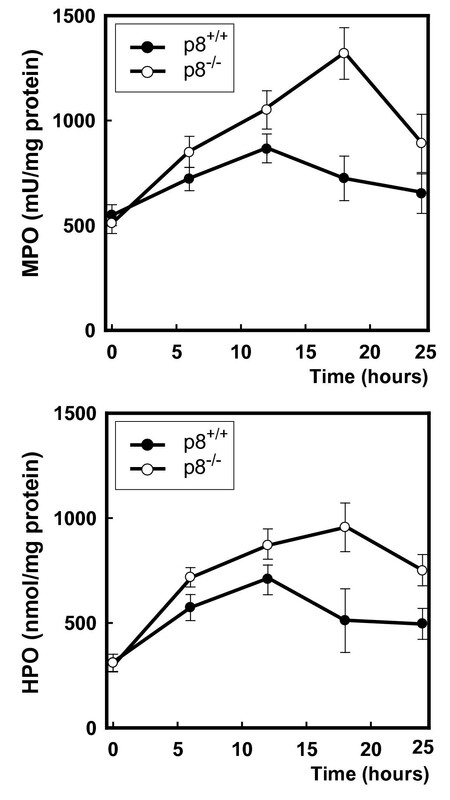 Wild-type and p8-deficient mice were injected intraperitoneally with 70 mg/kg LPS (Salmonella thyphosa), and Myeloperoxidase (MPO) activity and Hydroperoxide (HPO) concentration were measured in lung after 6, 12, 18 and 24 hours. Errors bars represent the standard deviation (n = 7). Wild-type and p8-deficient mice were injected intraperitoneally with 70 mg/kg LPS (Salmonella thyphosa), and Myeloperoxidase (MPO) activity and Hydroperoxide (HPO) concentration were measured in liver after 6, 12, 18 and 24 hours. Errors bars represent the standard deviation (n = 7). Wild-type and p8-deficient mice were injected intraperitoneally with 70 mg/kg LPS (Salmonella thyphosa), and Myeloperoxidase (MPO) activity and Hydroperoxide (HPO) concentration were measured in pancreas after 6, 12, 18 and 24 hours. Errors bars represent the standard deviation (n = 7). Liver was chosen as a target tissue of the LPS to decipher the role p8 in constitutive gene expression and in the response to LPS. We compared the expressions of ~6,000 different genes in liver from p8+/+ and p8-/- mice, without treatment and 12 hours after an intraperitoneal injection of LPS. The gene expression pattern of p8-/- mouse liver was compared to that of wild-type, in basal conditions, using DNA microarray analysis. Only genes whose expression differed by a factor ≥ 2 were considered (Tables 1 and 2 [see Additional file 1]). Of the ~6,000 known genes and ESTs monitored, 156 (2.6%) showed consistent differences. As control, expression of several genes chosen at random was measured by RT-PCR analysis and results confirmed microarray data (not shown). In p8-/- liver, the expression of 78 known genes and 33 ESTs (1.85%) was lowered (by a factor of 2 to 8), and that of 25 known genes and 20 ESTs (0.75%) was increased (by a factor of 2 to 11.1) compared to wild-type. Of the 78 known genes down-regulated as a result of p8 deficiency, 14 were implicated in protein synthesis, transport or post-translation modifications, 11 were implicated in signaling, 7 coded for secretory factors and 2 for cytoskeletal proteins, 13 were transcription factors or involved in RNA processing, 3 coded for apoptosis-related proteins, 7 corresponded to membrane or transporter proteins, 17 to cytosolic enzymes or detoxification factors, and 4 were proteins implicated in cell growth. Among genes up-regulated as a consequence of p8 deficiency, 6 corresponded to signaling molecules, 4 coded for secretory factors, 3 for cytoskeletal proteins, 5 for transcription factors or for proteins involved in RNA processing, 1 was apoptosis-related, 4 corresponded to membrane and transporter proteins and 2 were cytosolic enzymes. The list of ESTs up- or down-regulated by a factor of at least 2 is available at http://www.marseille.inserm.fr/Site_INSERM/emi0116/resultsESTs.htm. Pure SV129J mice were treated with 70 mg/kg of LPS from Salmonella thyphosa and gene expression in the liver was compared to expression in the liver of mice injected with saline. Expression of 105 known genes (1.77%) and 73 ESTs (1.22%) was up-regulated (by a factor of 2 to 62.3) whereas expression of 232 (3.87%) known genes and 138 ESTs (2.30%) was down-regulated (by a factor from 2 to 68.3). Known genes up-regulated by LPS treatment were grouped as follows: 4 genes coded for proteins implicated in protein synthesis, transport or post-translational modifications, 17 for proteins involved in signaling, 23 genes corresponded to secretory factors, 5 to cytoskeletal proteins, 27 to transcription factors or molecules involved in RNA processing, 1 gene coded for an apoptosis-related protein, 19 corresponded to membrane or transporter proteins, 5 to cytosolic enzymes and detoxification factors, and 4 were implicated in cell growth. Among known genes down-regulated as consequence of LPS treatment, 23 were implicated in protein synthesis, transport or post-translational modifications, 34 corresponded to signaling molecules, 16 were secretory factors, 7 coded for cytoskeletal proteins, 20 for transcription factors and RNA processing proteins, 5 coded for apoptosis-related proteins, 31 corresponded to membrane or transporter proteins, 79 to cytosolic enzymes or detoxification factors, and 17 corresponded to growth-related factors. Results are shown in Tables 3 and 4 [see Additional file 2]. The list of ESTs up- or down-regulated by LPS by a factor of at least 2 is available at http://www.marseille.inserm.fr/Site_INSERM/emi0116/resultsESTs.htm. Effect of LPS treatment on liver gene expression was also analyzed in p8-/- mice. Results are presented in Tables 5 and 6 [see Additional file 3]. Five hundred and twelve (8.53%) showed consistent changes in expression level of at least 2-fold. Expression of 212 known genes and 125 ESTs (2.08%) was up-regulated (by a factor of 2 to 50.0), and 90 known genes and 85 ESTs (1.42%) were down-regulated (by a factor of 2 to 29.9). Among up-regulated genes, 30 coded for proteins implicated in protein synthesis, transport or post-translation modifications, 45 for genes involved in signaling, 22 corresponded to secretory factors, 16 to cytoskeletal proteins, 34 to transcription factors and RNA processing molecules, 7 genes encoded apoptosis-related proteins, 34 corresponded to membrane or transporter proteins, 13 to cytosolic enzymes or detoxification factors, and 11 to proteins implicated in cell growth. Among down-regulated genes, 1 coded for a mitochondrial stress protein, 8 corresponded to signaling molecules, 10 to secretory factors, 3 to cytoskeletal proteins, 9 encoded transcription factors or proteins involved in RNA processing, 1 to an apoptosis-related protein, 10 corresponded to membrane or transporter proteins, 45 to cytosolic enzymes and detoxification factors, and 3 corresponded to growth-related factors. To be physiologically relevant, modifications in gene expression observed in p8-/- liver after LPS have to be significant compared to normal wild-type liver (e.g. : a gene down-regulated by a factor of 2 in p8-/-, compared to wild-type, must be up-regulated at least 4 times after LPS to be physiologically significant). Interestingly, it was indeed the case for more than 90% of genes up-regulated and 99% of genes down regulated after LPS. ESTs up- or down-regulated by LPS in p8-/- liver by a factor of at least 2 are available at http://www.marseille.inserm.fr/Site_INSERM/emi0116/resultsESTs.htm. If the total number of genes with significantly altered expression after LPS was similar in p8+/+ and p8-/- livers, the regulatory patterns were very different. Twice more genes were upregulated in p8-/- than in p8+/+ mice (337 vs. 178), the proportion being reversed for down-regulated genes (175 vs. 370). Among known genes, only 51 and 42 were up- and down-regulated, respectively, in both p8+/+ and p8-/- livers. More strikingly, several genes were oppositely regulated, including 19 genes down-regulated in p8+/+ but up-regulated in p8-/- liver and one gene up-regulated in p8+/+ but down-regulated in p8-/- liver, which underscores the differences between LPS-induced gene regulation patterns in p8+/+ and p8-/- livers. Finally, because the effects of HMG1 and p8 seem to be opposite (e.g. : HMG1 play a pro-inflammatory role whereas p8 acts as an anti-inflammatory factor), we analyzed in detail expression of HMG1 mRNA by semiquantitative RT-PCR. Contrary to the HMG-related proteins HMG-I(Y) and p8 which are activated in liver by LPS treatment, HMG1 mRNA expression remains unchanged after 6 and 18 hours (Figure 6). This is in fact not a surprise since HMG1 expression in liver by LPS seems to be activated by 2–3 folds within the first 2 hours following LPS treatment, returning to the untreated value thereafter . Another important difference to be noted is that whereas p8-/- mice were normal, HMG1-/- pups are born alive, but die within 24 hours due to hypoglycemia . Wild-type mice were injected intraperitoneally with 70 mg/kg LPS (Salmonella thyphosa), and mRNA expression was measured in liver after 6 and 18 hours. RNA was extracted using Trizol procedures and 1 μg RNA was analyzed by RT-PCR using specific primers for HMG1, p8 and ribosomal protein L3 (RL3) as a control as described in Material and Methods. We constructed a p8-/- mouse as a tool to investigate the function of the p8 gene. p8-deficient mice were fertile, developed normally and showed no obvious signs of disease up to 20 months of age. These findings imply either that p8 is not involved in crucial developmental processes or that other genes are functionally redundant. 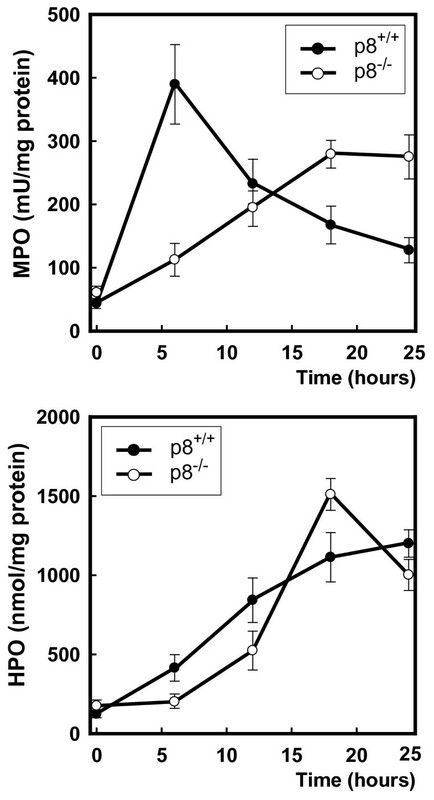 However, p8-deficient mice were more sensitive to the noxious effects of LPS, as evidenced by decreased survival (Figure 1), increased levels of serum TNF-α (Figure 2) and higher levels of MPO and HPO in some tissues (Figure 3, 4 and 5), compared to wild-type, which suggests the implication of p8 in important defence mechanisms. Because p8 is biochemically related to HMG-I(Y) proteins , which play a critical role in architectural changes of DNA to modulate gene expression [14–17], we made the hypothesis that, under conditions of stress, p8 regulates gene expression to improve cell resistance. Lack of p8 expression would therefore prevent adequate stress response with, as consequence, increased mouse mortality. Liver was chosen as model organ to test that hypothesis, because it is known that LPS triggers in that organ important changes in the expression of several genes [18, 19]. To analyze in p8-/- mice how the lack of p8 might alter liver response to LPS, we documented by microarray DNA studies the pattern of gene expression in p8-/- liver, for comparison with wild-type, then the response of wild-type liver to LPS for eventual comparison with p8-/- liver. As speculated, the pattern of liver gene expression was strongly altered as a consequence of p8 gene disruption. Compared to wild-type, 156 genes (2.6%) showed significant changes in their expression (111 repressed and 45 induced). Therefore, many genes are either directly dependent on p8 for adequate expression, or indirectly modulated in response to perturbations resulting from its absence. p8 seems to be preferentially, but not exclusively, a positive regulator since more than two thirds of the genes were down-regulated in the p8-/- liver. Interestingly, p8 interferes with most cellular functions since genes altered upon p8 disruption were involved in transcription and RNA processing, protein synthesis, transport and post-translational modification, apoptosis, regulation of cell growth, intracellular signaling, or encoded secretory or cytoskeleton proteins, membrane and transporter proteins, cytosolic enzymes and detoxification factors. Modulation by LPS of liver gene expression was first assessed in wild-type mice. Among the ~6000 known genes and ESTs of the microarray, 548 (9.1%) showed significant change (at least twofold) in their expression. Up-regulation was observed for 178 genes, whereas 370 genes were down-regulated. As shown in Tables 3 and 4 [see Additional file 2], genes implicated in all major intracellular pathways are involved in the liver response to LPS. Such a wide spectrum of changes after endotoxin treatment was already reported in other tissues [20–22]. Although the influence of LPS on liver is not the main objective of this work, it is noteworthy that many interesting genes are found strongly up-regulated (e.g. : proteasome subunits, PAI-I, MIG, mag-1, Scya 5) or down-regulated (EGF receptor-binding protein, MHL-1, IL-6 receptor), underscoring that LPS had triggered a very elaborate response. In p8-/- mice, liver gene expression was also strongly modified by LPS. To our surprise, the total number of genes with altered expression was almost the same as in wild type (512 vs. 548). However, only 93 of them (1.55%), because they show the same regulation (up- or down) as in wild-type, would be regulated after LPS challenge through p8-independent pathways. Therefore, a large number of genes whose regulation is part of the normal response to LPS could not be properly modulated in p8-/- mice. Because these genes are involved in major cellular functions (Tables 3, 4, 5 and 6 [see Additional files 2 and 3), such alteration could be partly responsible for the increased sensitivity of p8-/- mice to LPS, inasmuch as other organs should be similarly affected. Some genes previously reported as protective against LPS challenge, such as GARG-16 , SAA5  and SOD3  were actually found overexpressed after LPS in wild-type but not in p8-/- livers. Other genes identified in this systematic study could therefore lead to novel therapeutic strategies in endotoxin-mediated pathologies. In addition to preventing adequate regulation of many genes involved in the normal response to LPS, lack of p8 perturbated the expression of a large number of other genes, which were improperly up- or down-regulated. These genes belonging to many cellular pathways, further intracellular perturbations are expected which may amplify the noxious consequences of LPS administration. Among genes specifically activated by LPS in p8-deficient liver, the chromatin nonhistone high mobility group protein HMG-I(Y) gene (accession # J04179) was of particular interest because the corresponding proteins are structurally and biochemically similar to p8, which suggests similar functions [ and unpublished results]. In response to LPS, expression of p8 is strongly overexpressed in liver  whereas HMG proteins are not activated (Table 3 [see Additional file 2]). Yet, in p8-deficient mouse liver, the HMG-I(Y) protein was activated 8.5 fold, which may reflect a compensatory mechanism. These results strongly suggest that p8, which is probably a transcription factor , is a key regulatory gene in the cellular response to LPS. If its absence is apparently without important consequences in normal conditions, it prevents mice from fully developing their defence program against LPS challenge. In conclusion, this work demonstrates that p8 overexpressed in response to LPS is not a mediator of tissue insult but rather an important component of a defence program. Microarray DNA analysis of liver gene expression demonstrated the crucial role of the protein in the regulation of important cellular pathways. If the technical limitation of that analysis to roughly one fifth of the genome prevented thorough description of the p8 pathway, the information gathered should provide ground for many further studies concerning p8 function and the cellular response to endotoxin challenge. The construction of the targeting vector used in the targeted disruption of the p8 locus in embryonic stem cells of mouse strain 129/Sv was previously reported by Kuhbandner et al. . ES cells from three heterozygous clones for the mutated p8 allele were injected into blastocysts of C57BL/6 mice. We obtained in the littermates 7 male mice highly chimerical. They were intercrossed with wild-type C57BL/6 females and 4 showed germline transmission. Genotype identification was done by PCR and/or Southern blot with genomic DNA prepared from tail biopsies of 10 day-old mice. 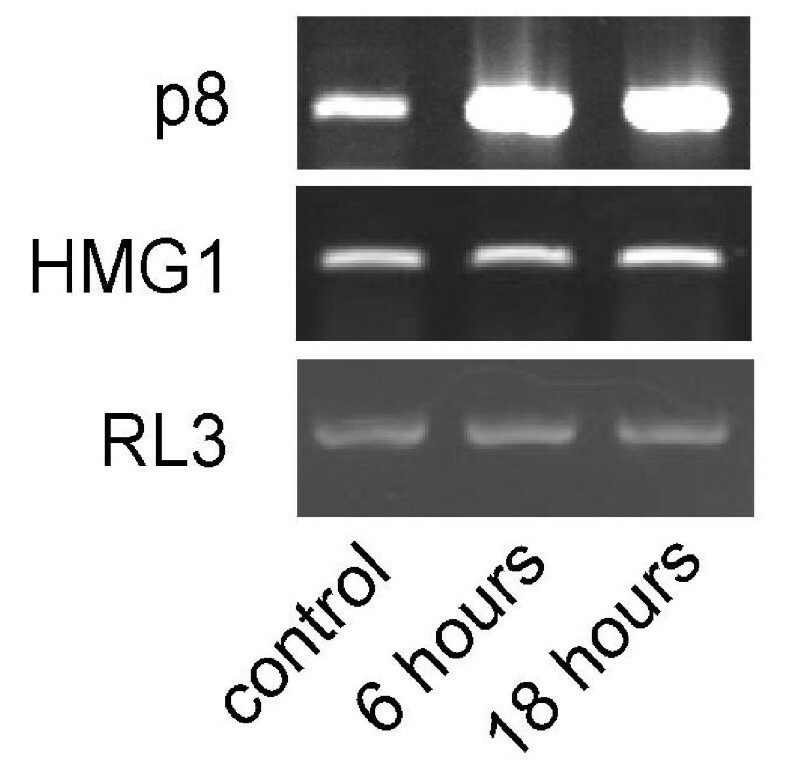 Heterozygous mice for the mutated p8 allele were obtained and used in breeding experiments to generate mice homozygous (-/-) for the disruption of p8. p8-deficient mice were backcrossed to SV129J mice for nine generations as recently described . Mice were housed in rooms maintained at constant temperature and humidity and subjected to a 12-h light/dark cycle. Mice received normal rodent chow (Purina, St. Louis, MO) and water ad libitum. Three months old females were used. Animals (p8+/+ and p8-/-) were injected intraperitoneally with 70 mg/kg of LPS (Salmonella thyphosa, Sigma) resuspended in sterile saline. This dose of LPS was chosen on the basis of preliminary studies in wild-type 129/Sv mice in which the dose resulted in less than 50% mortality. Deaths were recorded every 12 hours, and mice that survived 5 days had fully recovered and were considered as long-term survivors. Amylase and GOT activities were determined with commercially available assays kits from Roche Biochemicals and Sigma Diagnostics respectively following manufacturer recommendations. 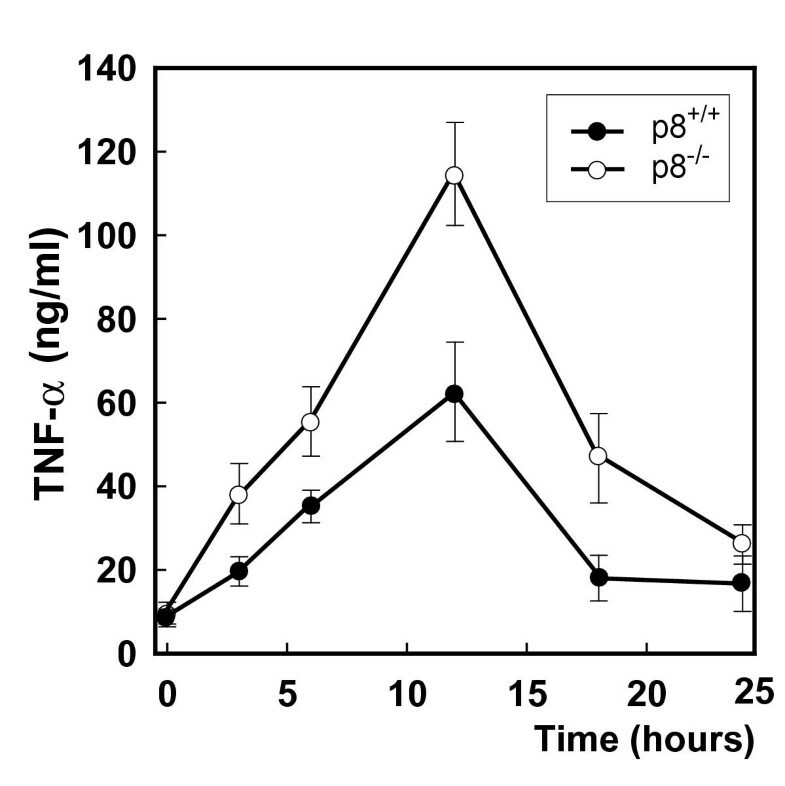 For determination of TNF-α release kinetics in serum, mice were killed at the indicated time points after treatment, and serum samples were harvested. TNF-α serum level was determined with a commercially available enzyme-linked immunoabsorbent assay (ELISA) kit (R&D Systems). Myeloperoxidase was measured photometrically with 3,3',5,5'-tetramethylbenzidine as substrate as previously described . Samples were macerated with 0.5% hexadecyltrimethylammonium bromide in 50 mM phosphate buffer pH 6.0. Homogenates where then disrupted for 30 s using a Labsonic (B Braun) sonicator at 20% power and submitted to three cycles of snap freezing in dry ice and thawing before a final 30 s sonication. Samples were incubated at 60°C for 2 hours and then spun down at 4000 × g for 12 min. Supernatants were collected for myeloperoxidase assay. Enzyme activity was assessed photometrically at 630 nm. The assay mixture consisted of 20 μl supernatant, 10 μl tetramethylbenzidine (final concentration 1.6 mM) dissolved in DMSO, and 70 μl H2O2 (final concentration 3.0 mM) diluted in 80 mM phosphate buffer pH 5.4. Tissue samples were homogenized and lipid hydroperoxides were extracted with a mixture of sample:Methanol:Chloroform 1:1:2. The chloroform extract was carefully collected and used to measure the hydroperoxide concentration with a commercially available assay kit from Cayman Chemical (Ann Arbor, MI). Mice p8+/+ and p8-/- were injected with 70 mg/kg of LPS (Salmonella thyphosa, Sigma) or saline. Animals were sacrificed after 12 hr and liver recovered and stored at -80°C before RNA extraction. Total RNA was prepared from liver using the Trizol reagent (Life Technologies). Twenty μg of total RNA was converted to cDNA with SuperScript reverse transcriptase (Gibco-BRL), using T7-oligo-d(T)24 as a primer. Second-strand synthesis was performed using T4 DNA polymerase and E. Coli DNA ligase followed by blunt ending by T4 polynucleotide kinase. cDNA was isolated by phenol-chloroform extraction using phase lock gels (Brinkmann). cDNA was in vitro transcribed using the T7 BioArray High Yield RNA Transcript Labeling Kit (Enzo Biochem, New York, N.Y.) to produce biotinylated cRNA. Labelled cRNA was isolated using an RNeasy Mini Kit column (Qiagen). Purified cRNA was fragmented to 200–300 mer cRNA using a fragmentation buffer (100 mM potassium acetate-30 mM magnesium acetate-40 mM Tris-acetate, pH 8.1), for 35 min at 94°C. The quality of total RNA, cDNA synthesis, cRNA amplification and cRNA fragmentation was monitored by micro-capillary electrophoresis (Bioanalizer 2100, Agilent Technologies). The cRNA probes were hybridized to an Mu11K oligonucleotide arrays (Affymetrix, Santa Clara, CA). The Mu11K oligonucleotide arrays represents ~6,000 sequences of mouse Unigene that have been functionally characterized and ~6,000 sequences ESTs clusters. Each sequence in the chip is represented by 32 probes : 16 "perfect match" (PM) probes that are complementary to the mRNA sequence and 16 "mismatch" (MM) probes that only differ by a single nucleotide at the central base (more detailed information about the Mu11K oligonucleotide arrays can be obtained in the web site http://www.affymetrix.com). Fifteen micrograms of fragmented cRNA was hybridized for 16 h at 45°C with constant rotation (60 rpm). Microarrays were processed in an Affymetrix GeneChip Fluidic Station 400. Staining was made with streptavidin-conjugated phycoerythrin (SAPE) followed by amplification with a biotinylated anti-streptavidin antibody and a second round of SAPE, and then scanned using an Agilent GeneArray Scanner (Agilent Technologies). Expression value (signal) is calculated using Affymetrix Genechip software MAS 5.0 (for fully description of the statistical algorithms see http://affymetrix.com/support/technical/whitepapers/sadd_whitepaper.pdf). Briefly, signal is calculated as follow : First, probe cell intensities are processed for global background. Then, MM value is calculated and subtracted to adjust the PM intensity in order to incorporate some measure of non-specific cross-hybridization to mismatch probes. Then, this value is log-transformed to stabilize the variance. Signal is output as the antilog of the resulting value. The 20 probe pairs representing each gene are consolidated into a single expression level. Finally, software scales the average intensity of all genes on each array within a data set. Final value of signal is considered representative of the amount of transcript in solution. Housekeeping controls β-actin and GAPDH genes serve as endogenous controls and are useful for monitoring the quality of the target. Their respective probe sets are designed to be specific to the 5', middle, or 3' portion of the transcript. The 3'/5' signal ratio from these probe sets is informative about the reverse transcription and in vitro transcription steps in the sample preparation. Then, an ideal target in which all transcripts was full-length transcribed would have an identical amount of signal 3' and 5' and the ratio would be equal to 1. Differences greater than three fold between signal at 3' and 5' for these housekeeping genes indicate that RNA was incompletely transcribed or target may be degraded. Ratio of fluorescent intensities for the 5' and 3' ends of these housekeeping genes was <2. Hybridization experiments were repeated twice using independent cRNA probes synthezised with RNA from two independent livers. Genes were considered as differentially expressed when both hybridizations showed >2 folds change. Data presented in this work represent the average of both hybridizations. Total RNA (1 μg) was analyzed by RT-PCR with the SuperScript™ One-step RT-PCR System and the Platinum Taq kit (Life Technologies). RT-PCR was performed using different numbers of cycles to verify that the conditions chosen were within the linear range. The mRNA coding for p8 was specifically amplified with sense (5'GAAGCTGCTGCCAATACCAACC3') and antisense (5'TAGCTCTGCCCGTCTACCCTC3') primers, in positions 181 and 540 of the cDNA (accession # AF131196), respectively. The mRNA coding for HMG1 was specifically amplified with sense (5'GGGACTATTAGGATCAAGCAATC3') and antisense (5'CCTAAACTAAGCAGATTAAGG3') primers, in positions 1501 and 1987 of the cDNA (accession # Z11997), respectively. As control, the transcript coding for the ribosomal protein RL3 was specifically amplified for 22 cycles with sense (5'GAAAGAAGTCGTGGAGGCTG3') and antisense (5'ATCTCATCCTGCCCAAACAC3') primers, in positions 216 and 637 of the cDNA, respectively (accession # NM_013762). We thank to Dr. E. Calvo for access to microarray facilities and interpretation of data. Supported by grants from Société de Secours des Amis des Sciences and EMBO short fellowship (S.V. ), Fondation pour la Recherche Médicale (A.H.), poste orange INSERM (A.G.M.). This work was supported by a grant from the Association pour la Recherche sur le Cancer (JLI) and FIS 02027 (DC). SV developed p8-/- mice, AH carried out LPS treatments and RNA purification, AG-M and MB was in charge of microarray hybridization, LS-M carried out some enzymatic dosages, PB participated in the analysis of gene expression data, FF carried out some enzymatic dosages and participated in design of the study, DC carried out RT-PCR controls and participated in design of the study, JCD participated in the design of the study, JLI participated in the analysis of data and wrote the manuscript. All authors read and approved the final manuscript.